Food wins wars! That’s right, right out of the blue Fluffy House and POP MART have revealed Mr White Cloud mini-series 3. 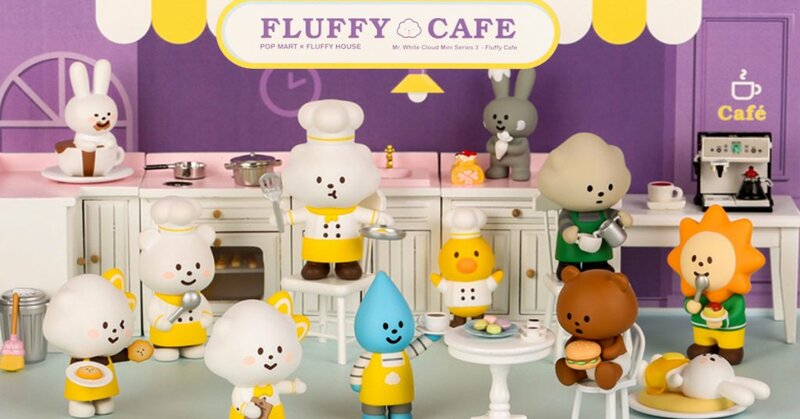 The all-new series features all the loveable Fluffy House characters running a cafe. Great British Bake Off lookout as the Fluffy House family are ready to take on the best in the business, Ha. Latte anyone? The poses in this series would make anyone go ahhhh. Check out Naughty Rabbit below as he’s up to mischief. 1 set with 12 figures is in blind box packaging. There’s also a secret figure in some of the sets by random. Every single box or set is filled with infinite cute surprises! Check out series 1 and 2 below.